Waterlogged. Las Posas and Agua Calientes Guatemala. Oso, with his wavy blond hair and piercing brown eyes, is quite the handsome bloke. He spend's half his time with his front paws in our laps, and the other half whimpering over his unrequited love for Malta. This charming pup is one of the reasons that we stay longer than planned at this camp spot. 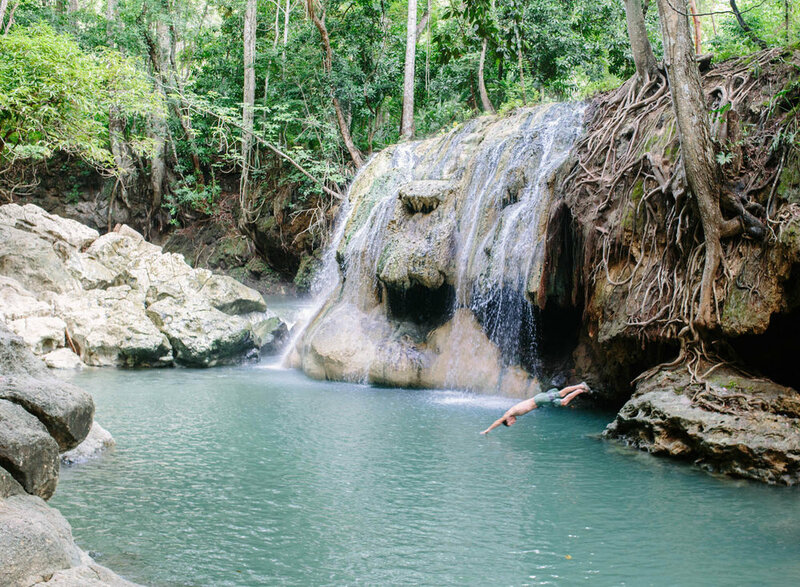 Las Pozas is a water park of sorts, built along a picturesque blueish-green river. 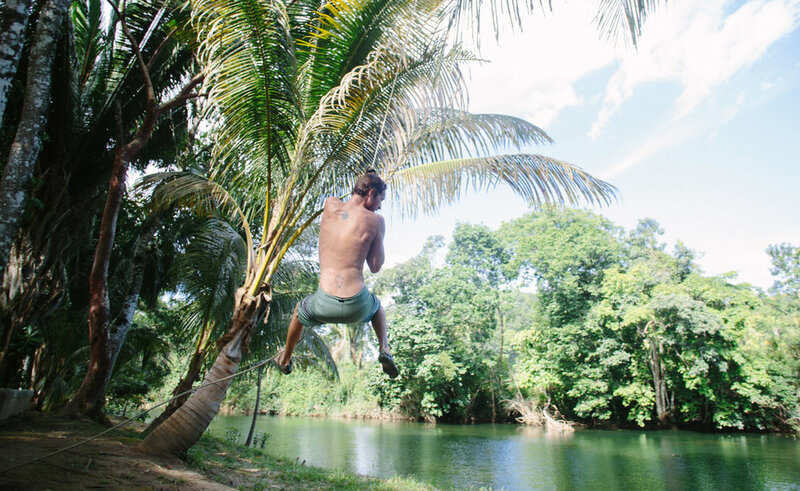 The friendly owner, Jose, has erected palapas, rope swings and zip lines on the riverside. It's low season so we have the place to ourselves. In the morning Jose brings over a cup of atol de elote (a tasty combo of corn, sweetened milk and cinnamon), and a bag of small yellow fruit called nances he picked from a tree on his property. They taste to us like an odd sour apple/pear combo. After our unconventional breakfast we get straight to playing in the river and rock hopping with Oso closely trailing Malta. The tall zip-line directly in front of us taunts us, but we've become pragmatic. Broken appendages in rural Guatemala sound like a bad idea, so we opt for much less terrifying rope swing. Soon, ignoring the zip-line becomes unbearable and we give it a shot. We spend what seems like hours climbing the slippery ladder, holding onto an even more slippery metal bar, leaping from a slightly unsteady balcony and gliding over the water until we're brave enough to let go. Feeling like we've put in a seriously hard day of acting like twelve year olds, we celebrate by grilling out and sitting around a campfire. We're on our way early the next morning with another water destination in mind. On our short drive we get another glimpse of how beautiful Guatemala is. and the sort of traffic jams we're likely to encounter. Soon we're parked next to Finca El Paraiso , a family's home/restaurant where we've decided to camp. Not two minutes after our arrival we're flanked by young girls selling coconuts. They're relentless, and even though we don't really want any, we buy two. They use giant knives and make quick work of cutting off the top, hand us a straw and VOILA! fresh coconut juice. One of the girls lingers, curious about our camper. Her name is Ana and we invite her in to give her our 1 minute tour. She's much more shy and tentative than when she isn't giving her very successful sales pitch. In my limited Spanish I ask her if she's in school. She says she goes Monday thru Wednesday from eight to noon. We're told later that school in Guatemala is mandatory and free until the age of twelve , but families have to pay for books and school supplies which many can't afford. Before she goes, we offer her some strawberries which she happily accepts. 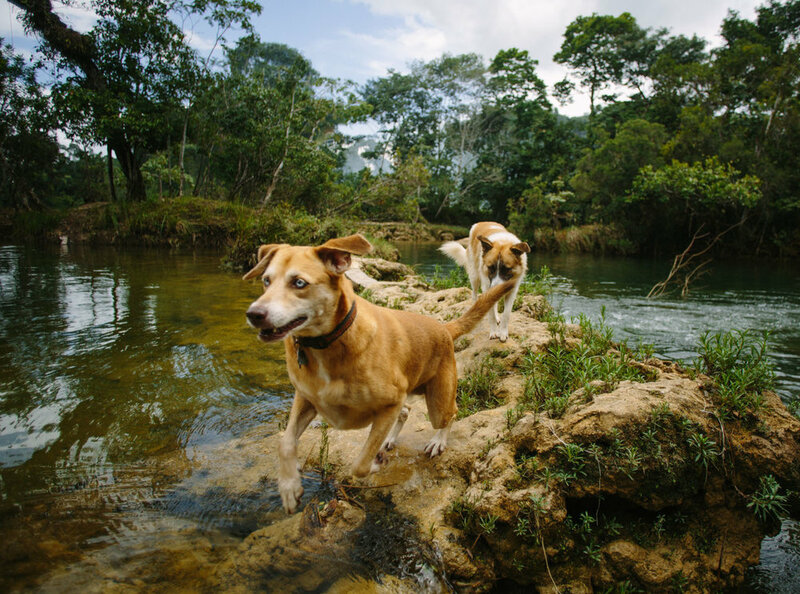 We make the short walk along the river to the swimming hole. Surrounded by gnarled jungle roots, through the faded light, Aguas Calientes looks more like a movie set than real life. The hot water fall, heated by a thermal spring, feeds into an icy river. It's hard to drag ourselves out of the water, but it's getting dark. On our way back we hear children yelling at us on the other side of the river. "Tienes fresas?" "Tienes fresas?!" It sound's like Anna's shared that we have a fruit stash. When we tell them...yes we do have strawberries....they run as fast as they can to catch up. When the property owner sees them, he shoos them away thinking they're bothering us. They hide behind a tree and when he's not looking. In a crouching stance, they sneak back up and gleefully relieve us of all our strawberries and leftover nances. At the waterfall the next morning we meet a family who tells us the mud from the pools has healing properties and is good for our skin. When they begin smearing it on their faces and offer us some we follow suit. It dries and hardens; we wash it off and sure enough our faces are as soft as they would be if we spent the day at an expensive spa. Ana and her coconut bearing freinds show up several more times before we leave. We don't mind, though, because interacting with them has been a highlight of our trip. After only a day and a half we end up buying eleven coconuts.